Twenty seven refugees with adverse ASIO security assessments exposed the detention regime with a ten day hunger strike at Broadmeadows detention centre in Melbourne. The refugees have won a meeting with Immigration to press their demands. They were left with no option but to put their bodies on the line. All the hunger strikers have refugee status, but the Immigration Minister has refused to issue their visas. They are being kept in indefinite detention because of their adverse ASIO assessment. There are more than 50 refugees in this situation around the country. Most of the hunger strikers have been in detention for between two to four years, and up until recently given absolutely no avenue to legally appeal against their ASIO assessment or even find out the reasons behind it. Their protest was sparked by news that a review into their cases is unlikely to change their situation. The High Court ruled in October last year that the government could not use ASIO assessments as a reason to deny refugees protection visas. In response, the government initiated a limited review process. Retired High Court Judge Margaret Stone was appointed the reviewer but when she visited Broadmeadows detention centre on April 3, she confirmed to the refugees that the process could still take months and that she will only have the power to make a recommendation to ASIO, not to release them. Having given these refugees some hope, Labor took it away again. While the Tamil refugees have received reasons for their adverse assessment, they are vague statements only a few paragraphs long. ASIO has presented no direct evidence or explanation for their decisions, simply asserting what ASIO “believes”. The power to release these refugees is still in the hands of the new Immigration Minister, Brendan O’Connor. The hunger striking refugees were demanding he release them immediately, one telling ABC, “we are waiting for one message, from his office, or from his mouth.” But he refused to do so. Instead he sent government lackey Paris Aristotle in four times to end the hunger strike, eventually succeeding in doing so. Outrageously, entry was refused to Greens Senator Sarah Hanson-Young. Julia Gillard perpetuated the idea these refugees are a threat to society, saying “national security concerns” must be considered. She denounced the hunger strike, saying, “you do not change your circumstances through hunger striking”. 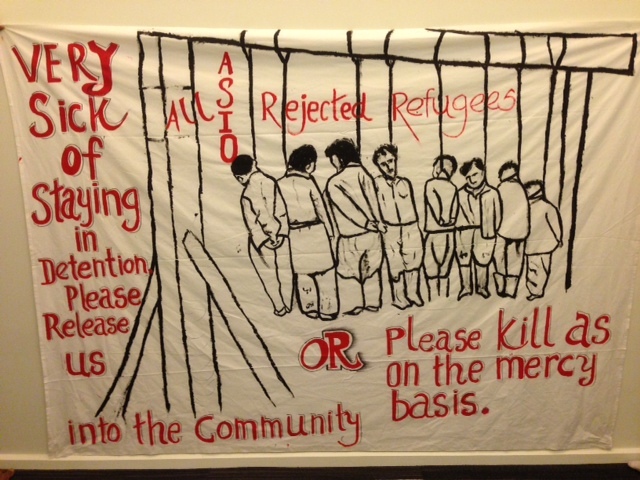 The refugee rights movement supported the hunger strikers with nightly vigils in front of the Broadmeadows detention centre and protests, drawing attention to the scandal of adverse ASIO assessments and the injustice of detention. This resistance inside detention came as the government’s own Immigration Department admitted the hell hole offshore camp on Manus Island is every bit as bad as refugee activists have been saying it is. A new Immigration Department report says that the cramped living arrangements present “key risks in terms of safety and health”, admits there is no reliable power supply, and limited water. The heat, the wet, the boredom, the terrible mosquitos, will mean an “increased risk of self-harm, mental health problems and problematic behaviour.” Since both the camps on Nauru and Manus have been opened, there have been several suicide attempts and many attempts at self-harm. Construction of a new centre is set to begin in July, at a cost of $171 million. But the Pacific Solution is in tatters. Manus and Nauru must be closed now. Rightly, Labor Left Senator Doug Cameron has said asylum seekers should be processed in Australia. Activists must keep the pressure on to break the bipartisan demonisation of asylum seekers.